This post will cover mounting a terminal barrier block which will be used as an interface between the existing RV-12 wiring harness and the wiring harness that will run to the Silent Hektik F-4118 regulator mounted inside the lower cowl on the baffle plate. Because the regulator is a high current device, ANY connector utilized needs to have pins rated for high currents. Sticky wicket #1: … sure there are plenty of connector styles available on the market but ones with pins rated 15 – 20 amps are quite limited. Sticky wicket #2 and the main reason I suggest builders DO NOT use any quick disconnects for the regulator wiring is: ... if one looks deeper into the application data sheets for the connectors, unfortunately, you will quickly discover all the connectors that have pins rated for high current have a VERY LIMITED INSERTION LIFE CYCLE, with the majority of connectors being under 10 insertions. This means that after removing the cowling just 10 times (some were as low as 6) the pins in the connector would need to be replaced in order to remain within the max current specification the connector’s pins are rated at. The best connector I could find is a very popular expensive military connector rated at 20 amps per pin and that only has a life span of 25 insertions. Because of the limited insertion ratings of the connectors, I decided it best to forget about using a quick disconnect connector altogether and would suggest others do so as well … at the currents we are talking about, a little increase in resistance at the connector pin can begin to create a considerable amount of heat at the connection leading to oxidation which increases the resistance generating more heat etc., to the point of melting insulation. This application requires a continuous low resistance connection … period. My solution will be to use a very high quality screw-down terminal block rated for high temperature environments. Suggest others doing this not use the lesser quality plastic terminal blocks … you want the good stuff for this application. 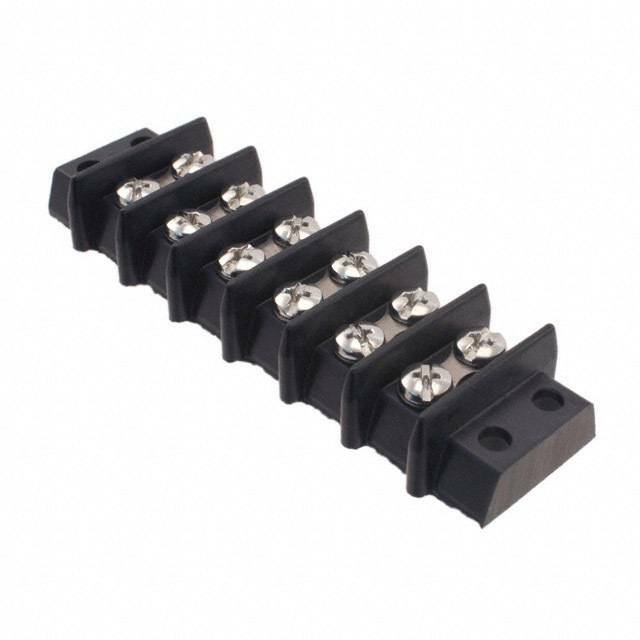 I chose a Cinch 6-142 phenolic terminal barrier block which is a 6 circuit barrier block rated at 30 amps per circuit and able to withstand temperatures to 300 degrees. Astute RV-12 builders may be asking themselves why use a 6 circuit barrier block when only 5 wires are run to the Ducati regulator? The answer is both the Ducati and Silent Hektik F-4118 regulators obtain their ground from the case being bolted to the aircraft airframe ... so this necessitates running a sixth wire that will be bolted to the regulator's case to supply the necessary ground for the regulator. So a ground wire will be run from the ground block on the DOG Aviation RV-12's firewall to the sixth terminal in the Cinch terminal block to provide the necessary ground. The Cinch 6-142 phenolic terminal barrier block. Decided a good and easy location to mount the Cinch terminal barrier block would be on the two rudder pedal studs that protrude the nutplates on the RV-12’s firewall shelf. Two 3/4" coupler nuts were screwed onto the protruding studs and blue Loctite was placed on the threads to prevent the nuts from coming loose. Plenty of threads to protruding the nutplates to install coupler nuts to use as a mounting point for the Cinch 6-142 terminal barrier block. 3/4" long stainless coupler nuts with 10-32 threads were screwed onto the portion of the rudder pedal mounting bolts that protrude the nutplates. Loctite 242 (blue) was placed onto the threads prior to installing the coupler nuts. Next a small mounting plate was fabricated with an offset to mount the Cinch terminal block. The small offset was used so there would be easy access for a screwdriver to remove the wires, The offset is not really necessary …. however, without the offset the coolant hose blocks easy access to some of the screws and would require the use of a stubby screwdriver. The Cinch 6-142 terminal block has an exposed bottom … meaning if one were to look up from the bottom one can see the metal inside. Although not necessary, I decided to cut a thin strip of Neoprene and use it as a sealing gasket under the connector block. The Cinch terminal blocks can use various mounting accessories. The DOG Aviation R & D department decided on using fast on connectors the side of the connector block that interfaces with the existing wiring which normally connects to the Ducati regulator. The beauty of this is ... if I decide to leave the Ducati regulator mounted on the firewall shelf as a spare, should the Silent Hektik regulator fail, the wires can easily be unplugged from the Cinch terminal block and moved back to the Ducati regulator. The wiring harness going to the regulator inside the lower cowl will have #8 ring terminals terminating at the Cinch terminal barrier block. This will allow the wires to be easily disconnected whenever the lower cowl needs to be removed. Sure it will be a bit of a hassle removing six screws every time the lower cowl needs to be removed, but the screw down terminal block will provide a very solid and low resistance interface connection between the existing wiring and the extension wiring to the regulator inside the lower cowl's air duct. Fabricated mounting plate and the Cinch 6-142 terminal barrier block attached to the rudder petal bolt studs via two stainless 3/4" 10-32 coupler nuts. The Ducati regulator can be seen in the background and there is more than enough wire to easily reach the Cinch terminal barrier block. Looking at the above photo, one can see that there are two 3/8" coupler nuts on the terminal block these will support a cover plate made from high temperature plastic that will cover the wires and connections when the final wiring is completed.